Published: Sept. 30, 2013 at 04:17 a.m.
(5:54) E.Manning sacked at NYG 34 for -2 yards (T.Hali). 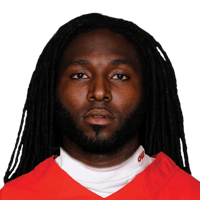 FUMBLES (T.Hali), RECOVERED by KC-D.Robinson at NYG 35. D.Robinson to NYG 35 for no gain (W.Beatty). Published: Sept. 29, 2013 at 02:15 p.m.
Kansas City Chiefs linebacker Tamba Hali gets into the backfield and forces an Eli Manning fumble in the second quarter.